The type of the BaseN'th base class (int means there are no further base classes). 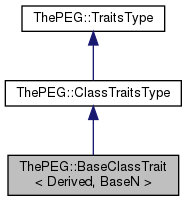 BaseClassTraits describes the base classes of the templated class. BaseClassTraits should be specialized once for each base class of a class to be described. The specializations should contain a typedef so that BaseClassTraits<T>::NthBase is made an alias for the first base class of T, BaseClassTraits<T>::NthBase the second base class and so on. The typedef defaults to int which means no base class. Definition at line 156 of file ClassTraits.h.